Watchmaker G-SHOCK is celebrating its 35th anniversary with the help of British band Gorillaz — together, the duo created a commemorative collection of the signature DW5600 timepieces. The watch was created with specific members of the band in mind — Noodle, 2D, Russel Hobbs and Murdoc Niccals. 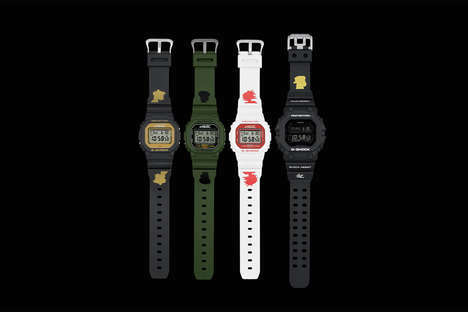 Every single digital watch is designed in a colorway that recalls respective members of the band, taking their personalities and character details into consideration. Each watch also comes with its own packaging that is finished in the correlating theme. 2D, Noodle and Murdoc’s iteration have a case entitled ‘The Origin,’ which is a design that was originally created in 1986. Russel Hobb’s has a GX56 encasing entitled ‘The King’ and it is powered with solar-charged elements. In addition to its intricate detail to design, the watches are resistant to mud and water up to 200 meters.